"Radio Free Europe" and "Radio Liberty" redirect here. For the R.E.M. song, see Radio Free Europe (song). For the UCKG UK radio station, see Liberty Radio. Not to be confused with Radio Freedom. Daisy Sindelar (Acting, since December 7, 2018). Radio Free Europe/Radio Liberty (RFE/RL) is a United States government-funded organization that broadcasts and reports news, information and analysis to countries in Eastern Europe, Central Asia and the Middle East where it says that "the free flow of information is either banned by government authorities or not fully developed". RFE/RL is a 501(c)(3) corporation supervised by the U.S. Agency for Global Media, an agency overseeing all U.S. federal government international broadcasting services. During the Cold War, Radio Free Europe (RFE) was broadcast to Soviet satellite countries and Radio Liberty (RL) targeted the Soviet Union. RFE was founded as an anti-communist propaganda source in 1949 by the National Committee for a Free Europe. RL was founded two years later and the two organizations merged in 1976. Communist governments frequently sent agents to infiltrate RFE's headquarters, and the KGB regularly jammed its signals. RFE/RL received funds covertly from the Central Intelligence Agency (CIA) until 1972. During RFE's earliest years of existence, the CIA and U.S. Department of State issued broad policy directives, and a system evolved where broadcast policy was determined through negotiation between them and RFE staff. RFE/RL was headquartered at Englischer Garten in Munich, West Germany, from 1949 to 1995. In 1995 the headquarters were moved to Prague in the Czech Republic. European operations have been significantly reduced since the end of the Cold War. In addition to the headquarters, the service maintains 17 local bureaus in countries throughout their broadcast region, as well as a corporate office in Washington, D.C. RFE/RL broadcasts in 25 languages to 23 countries including Armenia, Russia, Iran, Afghanistan, and Pakistan. Radio Free Europe was created and grew in its early years through the efforts of the National Committee for a Free Europe (NCFE), an anti-communist CIA front organization that was formed by Allen Dulles in New York City in 1949. The committee was composed of an "A list" of powerful U.S. citizens including former ambassador and first NCFE chairman Joseph Grew; Reader's Digest owner DeWitt Wallace; former diplomat and the co-founder of Public Opinion Quarterly Dewitt Clinton Poole; and prominent New York investment banker Frank Altschul. Radio Free Europe received widespread public support from Eisenhower's "Crusade for Freedom" campaign. In 1950, over 16 million Americans signed Eisenhower's "Freedom Scrolls" on a publicity trip to over 20 U.S. cities and contributed $1,317,000 to the expansion of RFE. The NCFE's mission was to support the refugees and provide them with a useful outlet for their opinions and creativity while increasing exposure to the modern world. The NCFE divided its program into three parts: exile relations, radio, and American contacts. Although exile relations were initially its first priority, Radio Free Europe (RFE) became the NCFE's greatest legacy. The United States funded a long list of projects to counter the Communist appeal among intellectuals in Europe and the developing world. RFE was developed out of a belief that the Cold War would eventually be fought by political rather than military means. American policymakers such as George Kennan and John Foster Dulles acknowledged that the Cold War was essentially a war of ideas. The implementation of surrogate radio stations was a key part of the greater psychological war effort. In January 1950 the NCFE obtained a transmitter base at Lampertheim, West Germany and on July 4 of the same year RFE completed its first broadcast aimed at Czechoslovakia. In late 1950, RFE began to assemble a full-fledged foreign broadcast staff, becoming more than a "mouthpiece for exiles". Teams of journalists were hired for each language service and an elaborate system of intelligence gathering provided up-to-date broadcast material. Most of this material came from a network of well-connected émigrés and interviews with travelers and defectors. RFE did not use paid agents inside the Iron Curtain and based its bureaus in regions popular with exiles. RFE also extensively monitored Communist bloc publications and radio services, creating an impressive body of information that would later serve as a resource for organizations across the world. In addition to its regular broadcasts, RFE spread broadcasts through a series of operations that distributed leaflets via meteorological balloons; one such operation, Prospero, sent messages to Czechoslovakia. From October 1951 to November 1956, the skies of Central Europe were filled with more than 350,000 balloons carrying over 300 million leaflets, posters, books, and other printed matter. The nature of the leaflets varied, and included messages of support and encouragement to citizens suffering under communist oppression, satirical criticisms of communist regimes and leaders, information about dissident movements and human rights campaigns, and messages expressing the solidarity of the American people with the residents of Eastern European nations. The project served as a publicity tool to solidify RFE's reputation as an unbiased broadcaster. Whereas Radio Free Europe targeted satellite countries, Radio Liberty targeted the Soviet Union. Radio Liberty was formed by American Committee for the Liberation of the Peoples of Russia (Amcomlib) in 1951. Originally named Radio Liberation, the station was renamed in 1959 after a policy statement emphasizing 'liberalization' rather than "liberation". Radio Liberty began broadcasting from Lampertheim on March 1, 1953, gaining a substantial audience when it covered the death of Joseph Stalin four days later. 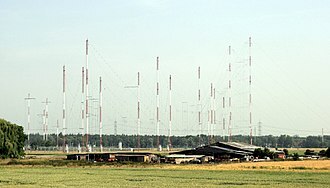 In order to better service a greater geographic area, RFE supplemented its shortwave transmissions from Lampertheim with broadcasts from a transmitter base at Glória in 1951. It also had a base at Oberwiesenfeld Airport on the outskirts of Munich, employing several former Nazi agents who had been involved in the Ostministerium under Gerhard von Mende during World War II. In 1955 Radio Liberty began airing programs to Russia's eastern provinces from shortwave transmitters located on Taiwan, while in 1959 Radio Liberty commenced broadcasts from a base at Platja de Pals, Spain. Radio Liberty expanded its audience by broadcasting programs in numerous non-Russian languages. By March, 1954 Radio Liberty was broadcasting six to seven hours daily in eleven languages. By December 1954, Radio Liberty was broadcasting in 17 languages including Ukrainian, Belarusian, Kazakh, Kyrgyz, Tajik, Turkmen, Uzbek, Tatar, Bashkir, Armenian, Azeri, Georgian, and other languages of the Caucasus and Central Asia. RFE played a critical role in Cold War era Eastern Europe. Unlike government censored programs, RFE publicized anti-Soviet protests and nationalist movements. Its audience increased substantially following the failed Berlin riots of 1953 and the highly publicized defection of Józef Światło. Its Hungarian service's coverage of Poland's Poznań riots in 1956 arguably served as an inspiration for the Hungarian revolution. During the Hungarian Revolution of 1956 RFE broadcasts encouraged rebels to fight and suggested that Western support was imminent. These RFE broadcasts violated Eisenhower's policy which had determined that the United States would not provide military support for the Revolution. In the wake of this scandal a number of changes were implemented at RFE including the establishment of the Broadcast Analysis Division to ensure that broadcasts were accurate and professional while maintaining the journalists' autonomy. RFE was seen as a serious threat by Romanian president Nicolae Ceaușescu. From the mid-1970s to his overthrow and execution in December 1989, Ceaușescu waged a vengeful war against the RFE/RL under the program "Ether". Ether operations include physical attacks on other Romanian journalists working for RFE/RL, including the controversial circumstances surrounding the deaths of three directors of RFE/RL's Romanian Service. On February 21, 1981, RFE/RL's headquarters in Munich was struck by a massive bomb, causing $2 million in damage. Several employees were injured, but there were no fatalities. Stasi files opened after 1989 indicated that the bombing was carried out by a group under the direction of Ilich Ramírez Sánchez (known as "Carlos the Jackal"), and paid for by Nicolae Ceaușescu, president of Romania. However, according to the former head of the KGB Counterintelligence Department K, general Oleg Kalugin, the bombing operation was planned over two years by Department K with the active involvement of a KGB mole inside the radio station, Oleg Tumanov. This revelation directly implicates KGB colonel Oleg Nechiporenko who recruited Tumanov in the early 1960s and was his Moscow curator. Nechiporenko has never denied his involvement. In an interview with Radio Liberty in 2003, he justified the bombing on the grounds that RFE/RL was an American propaganda tool against the Soviet Union. Tumanov was exfiltrated back to the USSR in 1986. Nechiporenko contacts with Carlos in the 1970s were confirmed by Nechiporenko himself in an article published by Segodnya in 2000 and by an article in Izvestia in 2001. For the first two days following the Chernobyl disaster on April 26, 1986, the official Eastern Bloc media did not report any news about the disaster and no full account for another four months. The people of the Soviet Union became frustrated with inconsistent and contradictory reports and 36% of them turned to Western radio to provide accurate and pertinent information. Listenership at RFE/RL "shot up dramatically" as a "great many hours" of broadcast time were devoted to the dissemination of life-saving news and information following the disaster. Broadcasts topics included "precautions for exposure to radioactive fallout" and reporting on the plight of the Estonians who were tasked with providing the clean-up operations in Ukraine. Communist governments also sent agents to infiltrate RFE's headquarters. Although some remained on staff for extended periods of time, government authorities discouraged their agents from interfering with broadcast activity, fearing that this could arouse suspicions and detract from their original purpose of gathering information on the radio station's activities. From 1965 to 1971 an agent of the Służba Bezpieczeństwa (Communist Poland's security service) successfully infiltrated the station with an operative, Captain Andrzej Czechowicz. According to former Voice of America Polish service director Ted Lipien, "Czechowicz is perhaps the most well known communist-era Polish spy who was still an active agent while working at RFE in the late 1960s. Technically, he was not a journalist. As a historian by training, he worked in the RFE's media analysis service in Munich. After more than five years, Czechowicz returned to Poland in 1971 and participated in programs aimed at embarrassing Radio Free Europe and the United States government." Polish Solidarity leader Lech Wałęsa and Russian reformer Grigory Yavlinsky would later recall secretly listening to the broadcasts despite the heavy jamming. The Soviet government turned its efforts towards blocking reception of Western programs. To limit access to foreign broadcasts, the Central Committee decreed that factories should remove all components allowing short wave reception from USSR-made radio receivers. However, consumers easily found out that the necessary spare parts were available on the black market while electronics engineers opposing the idea would gladly convert radios back to being able to receive short wave transmissions. The most aggressive and extensive form of reception obstruction was radio jamming. This was controlled by the KGB, which in turn reported to the Central Committee. Jamming was an expensive and arduous procedure, and its efficacy is still debated. In 1958, the Central Committee mentioned that the sum spent on jamming was greater than the sum spent on domestic and international broadcasting combined. The Central Committee has admitted that circumventing jamming was both possible and practised in the Soviet Union. Due to limited resources, authorities prioritized jamming based on the location, language, time, and theme of Western transmissions. Highly political programs in Russian, broadcast at prime time to urban centers, were perceived as the most dangerous. Seen as less politically threatening, Western music such as jazz was often transmitted unjammed. The intensity of jamming fluctuated over time. During and after the Cuban Missile Crisis in late 1962, jamming was intensified. The Cuban Missile Crisis, however, was followed by a five-year period when the jamming of most foreign broadcasters ceased, only to intensify again with the Prague Spring in 1968. It ceased again in 1973, when Henry Kissinger became the U.S. Secretary of State. The end to jamming came abruptly on November 21, 1988 when Soviet and Eastern European jamming of virtually all foreign broadcasts including RFE/RL services ceased at 21:00 CET. During the Cold War RFE was often criticized in the United States as not being sufficiently anti-communist. Although its non-governmental status spared it from full scale McCarthyist investigations, several RFE journalists including the director of the Czech service, Ferdinand Peroutka, were accused of being soft on Communism. Fulton Lewis a U.S. radio commentator and fervent anti-communist was one of RFE's sharpest critics throughout the 1950s. His critical broadcasts inspired other journalists to investigate the inner workings of the organization including its connection to the CIA. When its CIA ties were exposed in the 1960s, funding responsibility shifted to Congress. For more than two decades during the Cold War, the public was bombarded by an enormous publicity campaign to shape American views of Russia and its foreign policy. Advertisements appeared on every TV network, on radio stations across the country and in hundreds of newspapers. The campaign may have been the largest and most consistent source of political advertising in American history. RFE/RL received funds from the CIA until 1972. The CIA's relationship with the radio stations began to break down in 1967, when Ramparts magazine published an exposé claiming that the CIA was channeling funds to civilian organizations. Further investigation into the CIA's funding activities revealed its connection to both RFE and RL, sparking significant media outrage. In 1971 the radio stations came under public spotlight once again when prominent U.S. Senator Clifford Case introduced Senate Bill 18, which would have removed funding for RFE and RL from the CIA's budget, appropriated $30 million to pay for fiscal year 1972 activities, and required the State Department to temporarily oversee the radio stations. This was only a temporary solution, however, as the State Department was reluctant to take on such a significant long-term responsibility. In May 1972 President Richard Nixon appointed a special commission to deliberate RFE/RL's future. The commission proposed that funding come from the United States Congress and that a new organization, the Board for International Broadcasting (BIB) would simultaneously link the stations and the federal government, and serve as an orial buffer between them. Although both radio stations initially received most of their funding from the CIA, RFE maintained a strong sense of autonomy. Under Cord Meyer, the CIA officer in charge of overseeing broadcast services from 1954 to 1971, the CIA took a position of minimal government interference in radio affairs and programming. The CIA stopped funding Radio Free Europe and Radio Liberty in 1972. In 1974 they came under the control of an organization called the Board for International Broadcasting (BIB). The BIB was designed to receive appropriations from Congress, give them to radio managements, and oversee the appropriation of funds. In 1976, the two radio stations merged to form Radio Free Europe/Radio Liberty (RFE/RL) and added the three Baltic language services to their repertoire. In a response to United States Department of Justice requesting RT to register as a foreign agent under the Foreign Agents Registration Act, Russia's Justice Ministry also labeled RFE/RL and Voice of America as foreign agents in December 2017. During the Mikhail Gorbachev era in the Soviet Union, RFE/RL worked hand in hand with Glasnost and benefited significantly from the Soviet Union's new openness. Gorbachev stopped the practice of jamming the broadcasts, and dissident politicians and officials could be freely interviewed by RFE/RL for the first time without fearing persecution or imprisonment. By 1990 Radio Liberty had become the most listened-to Western radio station broadcasting to the Soviet Union. RFE/RL also played a significant role in the 1989 Velvet Revolution, which brought an end to the communist regime in Czechoslovakia. Following the November 17 demonstrations and brutal crackdown by Czechoslovak riot police, RFE/RL's Czechoslovak service reported that a student, Martin Šmíd, had been killed during the clashes. Although the report later turned out to be false – Šmid was alive and well – the story is cred by many sources with inspiring Czechoslovak citizens to join the subsequent (larger) demonstrations which eventually brought down the communist government. Upon hearing about the story, RFE/RL did not run it immediately, but attempted to find a second corroborating source for the story, as per official RFE/RL policy. While a second source was never found, RFE/RL eventually decided to run the story of Šmíd's death after it was reported by several major news organizations, including Reuters, the Associated Press, and the Voice of America. In addition, Pavel Pecháček, the director of RFE/RL's Czechoslovak service at the time, was mistakenly granted a visa to enter the country by the Czechoslovak authorities prior to the demonstrations. He reported live from the demonstrations in Wenceslas Square, and was virtually the only reporter covering the events fully and openly in the Czech language for a Czech audience. In 1995, RFE/RL moved its headquarters from Munich to Prague, to the building of the Czechoslovak Federal Assembly, which had been unoccupied since the 1992 dissolution of Czechoslovakia. The Clinton Administration reduced funding significantly and placed the service under the United States Information Agency's oversight. RFE/RL ended broadcasts to Hungary in 1993 and stopped broadcasts to Poland in 1997. In the late 1990s RFE/RL launched broadcast to Kosovo in Albanian and to Macedonia in Macedonian. Broadcast to the Czech Republic proceed for three more years under the agreement with Czech Radio. In 2004 RFE/RL stopped broadcasting to Estonia, Latvia, Lithuania, Slovakia, Croatia, Montenegro, Bulgaria, and Romania. However, on January 31, 2004, RFE/RL launched broadcasts to the former Yugoslavia in Serbo-Croatian (Serbian-Croatian-Bosnian-Montenegrin). In 1994–2008, RFE/RL used the former Federal Parliament building of the abolished Czechoslovakia in Prague New Town. For many years past 2001, security concrete barriers reduced the capacity of the most frequented roads in Prague center. RFE/RL states that its mission is to serve as a surrogate free press in countries where a free press is banned by the government or not fully established. It maintains 20 local bureaus, but governments criticised often attempt to obstruct the station's activities through a range of tactics, including extensive jamming, shutting down local re-broadcasting affiliates, or finding legal excuses to close down offices. In many of these countries, RFE/RL and similar broadcasters provide more reliable domestic news than local sources. RFE/RL says that its journalists and freelancers often risk their lives to broadcast information, and their safety has always been a major issue, with reporters frequently threatened and persecuted. RFE/RL also faces a number of central security concerns including cyberterrorist attacks and general terrorist threats. After the September 11 attacks, American and Czech authorities agreed to move RFE/RL's Prague headquarters away from the city center in order to make it less vulnerable to terrorist attack. On February 19, 2009, RFE/RL began broadcasting from its modern new headquarters east of the city center. In 1998, RFE/RL began broadcasting to Iraq. Iraqi president Saddam Hussein ordered Iraqi Intelligence Service, to "violently disrupt the Iraqi broadcasting of Radio Free Europe". IIS planned to attack the headquarters with RPG-7 from a window across the street. Czech Security Information Service (BIS) foiled the plot. The following month RFE/RL introduced a daily, one-hour Russian-language broadcast, broadcasting to the breakaway regions of South Ossetia and Abkhazia. The program, called Ekho Kavkaza (Echo of the Caucasus), focused on local and international news and current affairs, organized in coordination with RFE/RL's Georgian Service. On January 15, 2010, RFE/RL began broadcasting to the Pashtun tribal areas of Pakistan in Pashto. The service, known as Radio Mashaal, was created in an attempt to counter the growing number of local Islamic extremist radio stations broadcasting in the border region between Pakistan and Afghanistan. These local stations broadcast pro-Taliban messages as well as fatwas (religious edicts) by radical, pro-Taliban clerics. On October 14, 2014, Radio Free Europe/Radio Liberty (RFE/RL) and the Voice of America (VOA) launched a new Russian-language TV news program, Current Time, "to provide audiences in countries bordering Russia with a balanced alternative to the disinformation produced by Russian media outlets that is driving instability in the region". Over the next two years, Current Time – led by RFE/RL in cooperation with VOA – expanded to become a 24/7 digital and TV stream for Russian-speaking audiences worldwide. Around 2017, Voice of America and RFE/RL launched Polygraph.info, and the Russian-language factograph.info, as fact-checking sites. On 19 July 2018, RFE/RL announced it will be returning its news services to Romania and Bulgaria by the end of 2018 amid growing concern about a reversal in democratic gains and attacks on the rule of law and the judiciary in the two countries. The Romanian news service re-launched on January 14, 2019, and the Bulgarian service re-launched on January 21, 2019. ^ "Radio Free Europe/Radio Free Liberty". RadioFreeEurope/RadioLiberty. ^ John Prados, Safe for Democracy: The Secret Wars of the CIA (Ivan R. Dee, 2012). ^ a b "Radio Free Europe / Radio Liberty :: Coverage Map". flashvideo.rferl.org. ^ Weiner, Tim: "Legacy of Ashes", p. 36. Doubleday, 2007. ^ Using Balloons to Breach The Iron Curtain, Radio Free Europe/Radio Liberty (August 22, 2016). ^ Griffith, William. "Policy Review of Voice for Free Hungary Programming, October 23 – November 23, 1956" (PDF). National Security Archive. Retrieved 20 April 2015. ^ Byrne, Malcolm. "The 1956 Hungarian Revolution: A History in Documents". National Security Archive. Retrieved 20 April 2015. ^ Cummings, Richard. "Special Feature: The 1981 Bombing of RFE/RL". RFE/RL. Retrieved 17 April 2015. ^ ""Voices of Hope" Hoover Institution exhibit on RFE/RL". Archived from the original on 2013-10-18. ^ "Олег Туманов, "ПРИЗНАНИЯ АГЕНТА КГБ", ЧАСТЬ III – окончание". ^ "[ Радио Свобода: Программы: История и современность: Разница во времени ]". archive.svoboda.org. ^ "The Russian Teddy Bear was a KGB Mole: The Oleg Tumanov Story". coldwarradios.blogspot.co.uk. ^ Parta, R. Eugene (2007). Discoverying the Hidden Listener. Hoover Institute Press Publication. p. 57. ISBN 978-0817947323. ^ a b Sosin, Gene (2010). Sparks of Liberty: An Insiders Memoir of Radio Liberty. Penn State Press. p. 195. ^ Lipien, Ted (23 June 2007), "Old spy scandals still haunting US broadcasters? ", Spero News. ^ "Cummings, Richard, "The Best Spy Stories of the Cold War"". Archived from the original on 2009-03-13. ^ Johnson, A. Ross; Parta, R. Eugene (2010). Cold War Broadcasting. Budapest: Central European University Press. pp. 51–64. ISBN 9789639776807. ^ "Opinion - The C.I.A. 's Fake News Campaign". ^ Stahl, Lesley. "RT's or-in-chief on election meddling, being labeled Russian propaganda". CBS News. Retrieved 14 January 2018. ^ Osborn, Andrew. "Russia designates Radio Free Europe and Voice of America as 'foreign agents'". Reuters. Retrieved 14 January 2018. ^ "Unraveling the Šmid death story". ^ "Front Row Seat To The Revolution". ^ "Azerbaijan Bans RFE/RL, VOA, BBC Broadcasts". RadioFreeEurope/RadioLiberty. ^ a b "Czech Intelligence Reveals Iraqi Plot To Attack RFE/RL". RFE/RL. 30 November 2009. Retrieved 24 November 2015. ^ "Poetry from Paktia to Prague". ^ "Flashback (Sep. 18, 2009) Holbrooke at RFE Event: 'Deal with Taliban Propaganda Head-On'". ^ "RFE/RL Launching Russian-Language Show to South Ossetia & Abkhazia". ^ "RFE/RL Launches Radio Station in Pakistan's Pashtun Heartland". RFE/RL. 15 January 2010. Retrieved 15 January 2010. ^ "About Polygraph.info". Polygraph.info. Retrieved 27 March 2018. ^ "'We got our f**** a***s beat, Yankees made their point': Russian mercenaries in Syria lament U.S. strikes". Newsweek. 23 February 2018. Retrieved 27 March 2018. ^ Tomiuc, Eugen (2018-07-19). "RFE/RL To Launch News Services In Romania, Bulgaria". Radio Free Europe/Radio Liberty. Retrieved 2018-07-20. Cummings, Richard (2008). "'The Ether War: Hostile Intelligence Activities Directed Against Radio Free Europe, Radio Liberty, and the Émigré Community in Munich during the Cold War.'". Journal of Transatlantic Studies. Vol. 6, No. 2. Mikkonen, Simo (2010). "'Stealing The Monopoly Of Knowledge? : Soviet Reactions To U.S. Cold War Broadcasting'". Kritika: Explorations In Russian & Eurasian History. Molnár, József (2006). A Szabad Európa Rádió a forradalom napjaiban – Autobiography. ISBN 963-9592-10-2. Wikimedia Commons has media related to Radio Free Europe/Radio Liberty.